Austria’s far-right Freedom Party gained over one-fifth of the votes in Sunday’s general election, while the ruling two-party centrist coalition got its worst-ever result. The swing comes amid a Europe-wide surge in support for the far right. Though Austria’s two major centrist political parties, the conservative Popular Party and the center-left Social Democrats, have retained their majority in parliament, the resurrection of the far-right in Europe is a solid tendency marking a shift in the political mentality of Europeans. Euroskeptic and right-wing parties in Austria have gained support from people who think the issues that matter most to them aren’t being addressed. 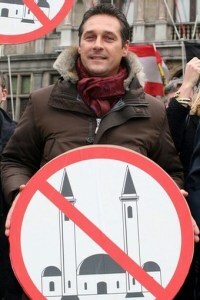 The leader of the Freedom Party, Heinz-Christian Strache [pictured], insists he is not a racist. “I love Austria, I don’t hate foreigners,” he says. It appears Anschluss and Seyss-Inquahrt are lost concepts to them. The RT report is rather misleading in claiming that the vote for the FPÖ represented a “swing to the right” in Austria. The picture is complicated by the fact that the FPÖ split in 2005 when Jörg Haider and other leading figures broke away to form a rival party, the BZÖ. As I point out in a note at the end of the RT report, at the previous general election in 2008 the FPÖ got 17.5% and the BZÖ 10.7%, making a total far-right vote of 28.2%. However, Haider was killed in a car crash shortly after the 2008 election, and in his absence the BZÖ’s support has slumped, with its vote falling to 3.6% in 2013. So, although the FPÖ’s vote rose to 21.4%, the total far-right vote was reduced to 25%. And because the BZÖ’s vote failed to reach the 4% threshold, and its representation in parliament was therefore wiped out, the total number of far-right MPs declined from 55 to 42. It’s also worth noting that the 25% of the vote won by the FPÖ/BZÖ combined is lower than the 26.9% that the FPÖ received in the 1999 general election, while the 21.4% of the vote received by the FPÖ is also lower than in 1994 (22.5%) and 1995 (21.9%). So it’s not really true that the FPÖ’s 2013 vote is part of “a tide that’s turning right” across Europe, as RT suggests. Substantial electoral support for the FPÖ long predates the present rise of Alternative für Deutschland or Golden Dawn. And the far-right vote in Austria today is slightly down on what it has been in the past. Having said that, of course, it’s still cause for worry that a party like the FPÖ can get over a fifth of the vote in the Austrian general election. Perhaps I’ve been reading too much Harry Turtledove, but any group that calls itself the ‘Freedom Party’ brings to mind some truly unsavory individuals.